For all your ski and snowboard rentals, we recommend our preferred partners. Condos in Steamboat and Fleischer Sport ultimate ski vacation experience! 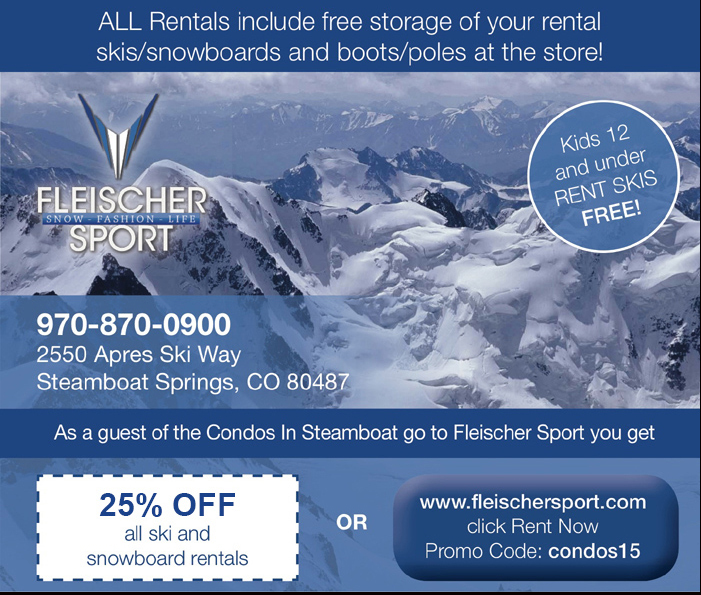 Fleischer Sport is Steamboat’s premiere ski/snowboard rental and demo shop in Steamboat Springs. Located at the base of the ski area adjacent to the Steamboat gondola, Fleischer Sport offers ski and snowboard rentals and demos, as well as a full retail department with top brands like Bogner, POC, Hestra, Dragon, Giro, and Shred. Owner Chad Fleischer, is a two time Alpine Winter Olympian and has created a shop focusing on world class customer service, great equipment, and the absolute best possible ski shop experience. Contact us to help make your Ski Vacation one to remember! Ski Haus is Steamboat’s oldest and most diversified ski/mountain shop. No other shop has the selection and diversity of equipment like Ski Haus. We offer a rental package for every budget and performance level. Ski Haus offers Rental and Demo equipment for Downhill Skiing, Snowboarding, Telemark Skiing, Alpine Touring, Backcountry, Cross Country, and Snowshoes. Ski Haus also offers a FREE SHUTTLE service. We will pick you up to rent your equipment, take you back to your lodge, or drop you off at the slopes. Once you are done with the equipment we will pick up it up for the return. Very easy and convenient. Don’t miss the legendary selection, value, and service of the Ski Haus Rental and Retail Shops. 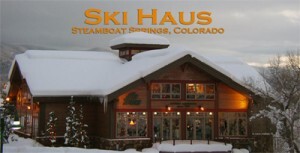 Ski Haus, serving Northwest Colorado and beyond since 1969! Save 15% off rental equipment when you stay with Condos in Steamboat. Click here to start your reservation. Steamb oat Springs, Colorado is home to five Christy Sports snowboard rental and ski rental shops that serve the many visitors and locals of the Yampa Valley. To Steamboat Springs, Christy Sports is a staple of the rich ski history in which the town is enamored. Rent your ski & snowboard equipment from one of their convenient locations. Save 20% off your rental equipment when you stay with Condos in Steamboat. Click here to start your reservation.